In 1970, Dong Won Fisheries Co., Ltd started as a fishing company operating a trawler and tuna long liner, and has grown into a diversified seafood company, operating 18 deep sea fishing vessels, 1 local subsidiary and 3 overseas companies including a seafood processing plant in China and cold storage facilities in New Zealand. witjnual revenue of USD 150 million. Our growth has been largely contributed to our spirit of challenge. We have always explored new areas in the business field and fishing areas. These efforts have contributed to the development of Korea's fisheries industry and inbecaming a leader in the world fisheries industry. In the early 1970s, ’Dong Won's efforts to secure a bridgehead in West African Sea with it's Las Palmas branch brought successful results, which helped pave the way for fishing operations for another 100 Korean vessels. The area was unexplored world to Korean companies in those days. During this process, Dong Won contributed to development of new diplomatic relationship with Republic of Guinea Bissau and Korean government honored Dong Won by awarding the Mok-Ryeon Jang, National medal. In 1990 when Korea had not established diplomatic relationship with China yet, Dong Won took a leading role in the establishment of Weidong Ferry Co., Ltd which operates car-ferries between Korea and China. It has grown into a company with over USD 100million in annual revenue and USD 12 million in net profit. Dong Won is concentrating on further expanding its business to the world by using Weihai Dong Won Food, a speciailized seafood processing company established in Weihai China, and Sanwon, located in Timarua, New Zealand, as overseas bridges into Japan, U.S.A., E.U. and other countries. 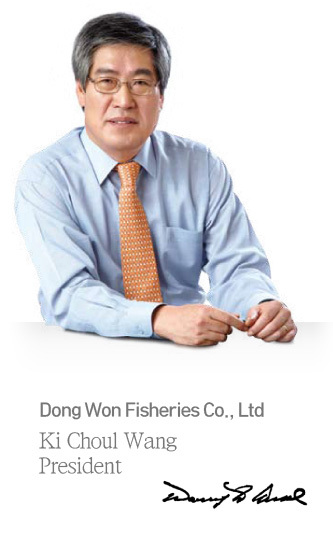 With the principle of customer satisfaction, Dong Won promises that we will not spare any efforts to provide high quality service and contribute to the improvement of our customers’health by increasing our capacity and specialization in maritime, food and distribution areas based on our long experience in deep water fisheries and seafoods distribution.